How many cats does one Watcher need? Role-playing in a game like Pillars of Eternity 2 is important, and I’ve decided that my Watcher is as devoted to rescuing the Deadfire’s neglected pets as he is chasing Eothas. As you explore the ports, cities, and villages of the archipelago you’ll find stray animals with names like ‘forsaken cat’ or ‘abandoned dog’ who can be adopted. And I’ve amassed a ludicrous collection in my tens of hours with the game, to the point where my stash now looks like a petting zoo. Pets aren’t just for show either. Choose one to follow you and you’ll get a nice buff, whether it’s Chauncey the pig’s +1 dexterity bonus, Peter the black cat’s 15% boost to area of effect spells, or Pancake the dog’s enhanced resistance to burn damage. Why does having a small dog nipping at your heels render you impervious to fire magic? Don’t think about it too much. Just go with it. Honestly, this is one of my favourite features in Pillars of Eternity 2. Every time I’m exploring somewhere and spot a new animal to scoop up, I get a genuine buzz of excitement. The buffs are relatively minor compared to other magical items, but I just like the idea that my Watcher is wandering around with a big sack of live animals slung over his shoulder. You can’t wander far in the game without finding animals to adopt. There are almost twenty in the capital city of Neketaka alone. Search a house in the Queen’s Berth district and you’ll find Xopn'aua, a poodle who gives you a +1 metaphysics bonus, obviously. On a terrace in the royal palace in Serpent’s Crown you’ll find Prissy snuffling around, a stray cat who makes healing potions 15% more effective. They’re everywhere. Some merchants sell them too. Tiabo in The Sacred Stair will sell you an animancy cat, who grants summoned creatures a might and penetration bonus, for a not insubstantial 8,500 coppers. And a cheery merchant called Ereti in Serpent’s Crown, west of the palace, sells a bunch of pets that were actually named by players as a $500 reward on the game’s Fig campaign. Someone on Twitter told me that one of the animals in my inventory was in fact their dearly departed dog Mercedes, which I thought was a really sweet tribute. 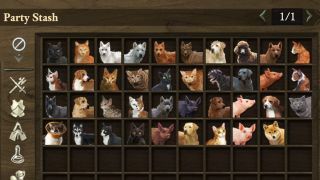 If, like me, your pet collection is getting out of control, it may be worth investing 3,000 copper in the menagerie ship upgrade. This puts a little pen on the lower deck of the Defiant where any pets stored in your stash will wander freely, which livens the place up, but serves no purpose other than looking cool. I don’t know how many pets I’ve still to find in the Deadfire, but I’m going to find them all, and they’re all going to be my friends. And hopefully there’ll be more to find in the forthcoming expansions. Yes, I know I have a problem.